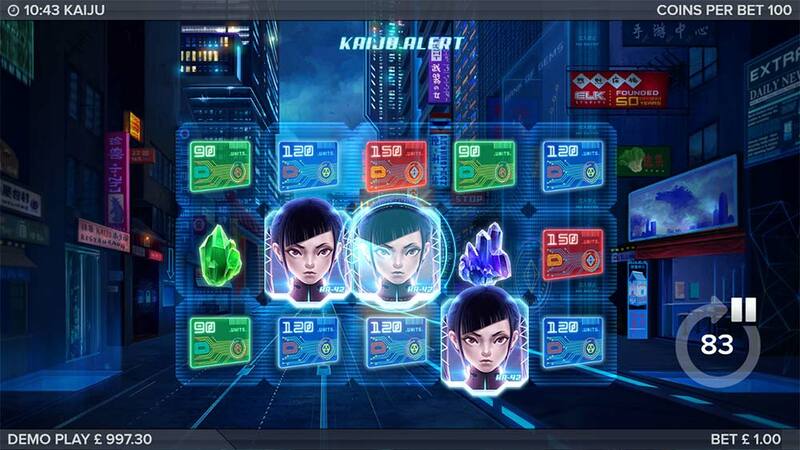 We Check out Kaiju, the Latest Futuristic Online Slot From ELK Studios. 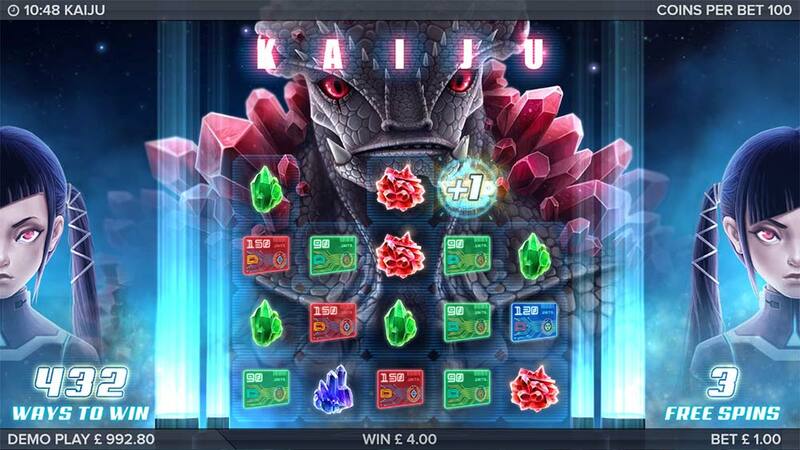 Mr Green Casino has just added the ELK Studios slot Kaiju (Japanese for “strange beast”) to their casino, this futuristic slot sets the scene of a futuristic world were the humans rely on the Kaiju for their gems which when collected are then used for trading. There is a whole backstory to this slot but essentially a nuclear powered female cyborg, HA-42 who is able to collect these dangerous gems from the Kaiju and convert them into a harmless state which is then used as currency. 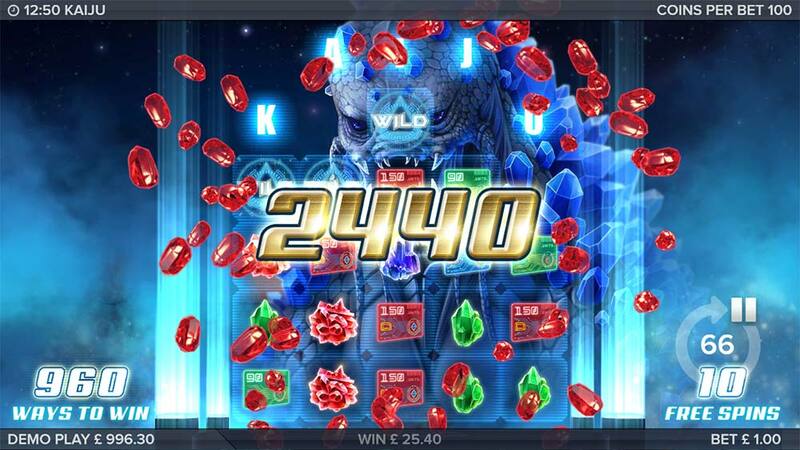 Kaiju uses a regular 5×3 reel layout and in the base game uses a 243-way payline structure with a few extra wild features, during the bonus round, however, the reels can permanently expand in size similar to slots such as White Rabbit reaching up to a massive 7776 ways to win with a whole host of extra wild functionality such as added Wild Reels and Sticky Wilds. 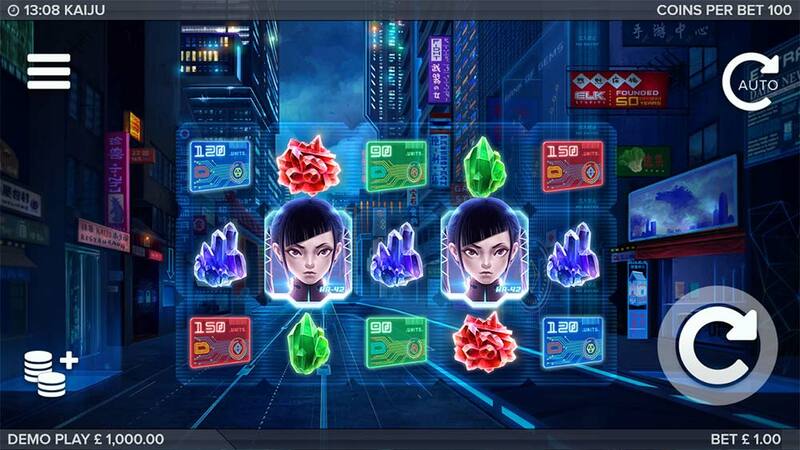 During the base gameplay, there is a feature called Vertical Laser which activates when three identical symbols that are vertically connected land on the reels, this then adds a Wild symbol above that reel prior to any payouts, this nice little feature gives you a good taste of what to expect in the free spins bonus round were these type of patterns unlock the reels increasing the number of winning ways permanently for the bonus round. The feature triggers when 3 identical symbols land on the reels in a vertical connection, this then leads to a Wild symbol being added above that reel for the spin creating additional winning opportunities. 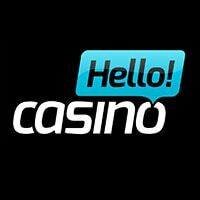 The main bonus round is triggered by landing 3 of the HA-42 Scatter symbols on the middle reels, you are then awarded an initial 7 free spins. One of the three Kaiju monsters is then chosen at random either red, green or blue. Each of the Kaiju has its own individual layout of hot spots which are activated by vertical lasers to be defeated. 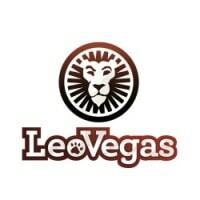 If you manage to land a Vertical laser combination this then reveals wilds and makes that reel expand upwards increasing the overall number of winning ways for the rest of the bonus. You are also granted 1 extra spin for each reel expansion up to the final hot spot at the top of the reels and if you manage to reveal all of the hot spots the monster is defeated and the bonus round ends. 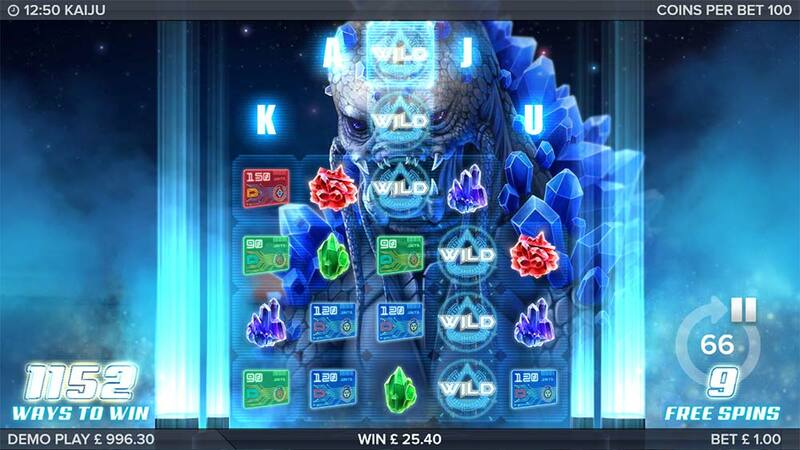 Kaiju is quite an enjoyable slot to play from ELK studios, whilst there isn’t too much extra going on in the base game with just the Vertical Laser feature occasionally adding extra wilds above the reels the bonus round can get very exciting once several of the extra areas start to unlock and increase the number of winning ways greatly. In our playtests, however, so far we have found that most of the bonus rounds seem to end in the range of 10x stake up to a 75x stake win, after more than 15 bonus rounds we have yet to hit one over 100x, this is mainly down to the increasing difficulty of unlocking further parts of the reels as they grow in size. 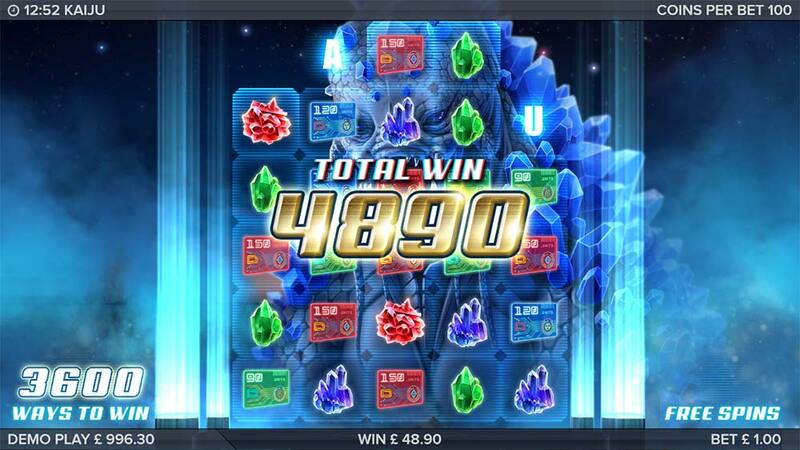 Overall though a decent slot to check out play from ELK, we just need to play it a bit more to see if there any “Super Big Wins” waiting to come from the Kaiju!